I woke up in Raven’s garden, had a nice hot shower, and made myself some tea. As the day began to warm up, I spread out my belongings and let them dry out a bit. The sky was scattered with clouds, but at least it wasn’t raining. Raven got up and gave me a tour of his garden. We talked for an hour or two about composting and permaculture. I chased a couple of baby garter snakes out of his vermiculture bin, as he claimed they were eating his worms. Most of his garden came from repurposed free or recycled materials… free wood from craigslist, irises that someone was going to throw out, coffee grounds from a local café turned into worm food. 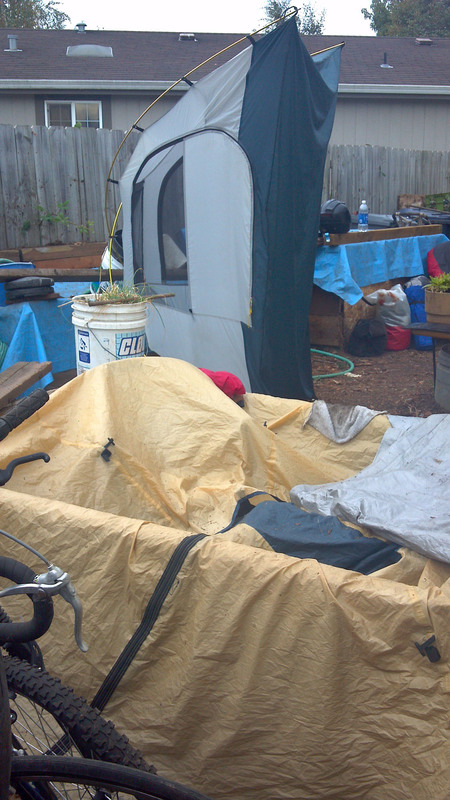 I gave him all the advice I could – I did permaculture gardening for 3 years when I lived in Eugene – and promised to give him the contact info for the local permaculture guild. I love resourceful people! 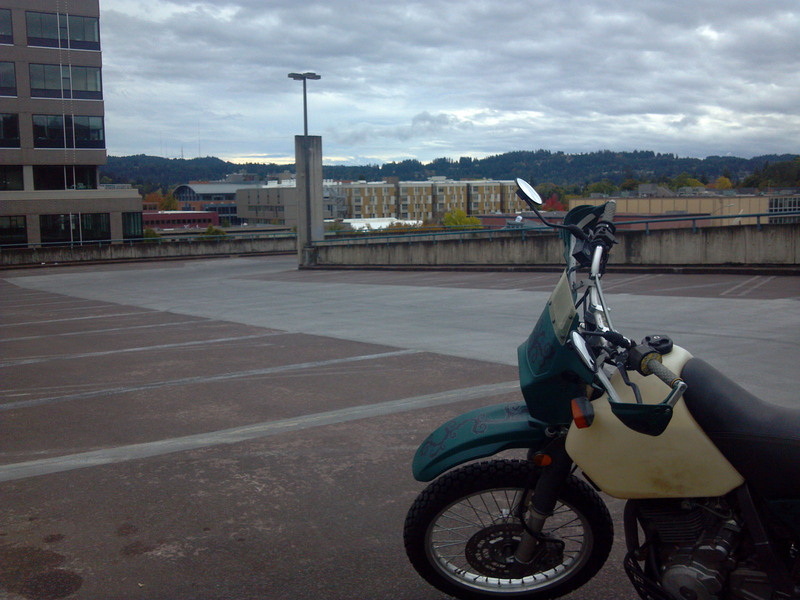 Later that afternoon, I hitched a ride with him downtown to try to bump start the bike. I had to get it out of the parking garage sometime that day. Weekends might be free, but come Monday morning they would start issuing tickets. 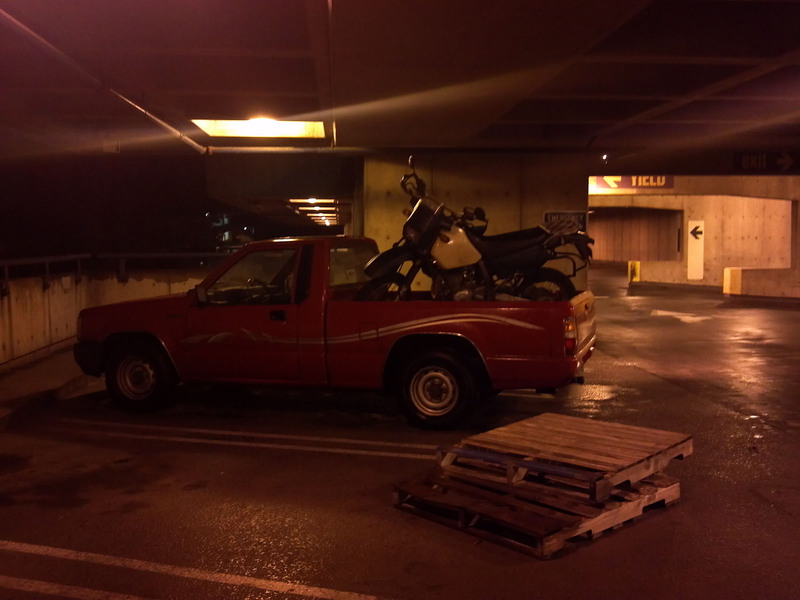 I figured that if I could just get it started, I could ride it somewhere safe and worry less about the situation. At first, I couldn’t even get the key to turn in the ignition! A quick trip to the nearest auto parts store for some graphite fixed that problem. 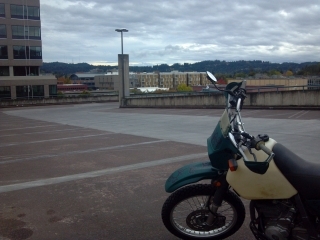 I unloaded the bike and pushed it up to the roof of the parking structure. Even without all my luggage, this was a real workout! Raven had the idea to tow me with the van to get going faster. I was extremely skeptical. I didn’t want the rope tangling in the wheel or to be stuck attached to the van, so he suggested I hold it and let go at the bottom of the “hill”. We made it about five feet before the bike toppled over. Too much pressure on one side of the handlebars and I couldn’t hold it. Luckily there was no damage. I decided that the clutch was dragging. There was definitely some first-gear resistance while the clutch lever was in, so I started adjusting it. Raven mentioned he had plans for the evening, so I decided to give it one last try. I pushed it to the roof again and rode it down to the next level, but I still couldn’t get enough speed. I abandoned the bike and went back to Raven’s to consider my options. I remembered that I used to have a friend in Eugene named Tal, but didn’t have his number any longer. He probably had a pickup truck, and might be able to bail me out. I managed to contact him online and he offered to pick up the bike and let me stay at his place while I figured out what to do. I gratefully agreed. 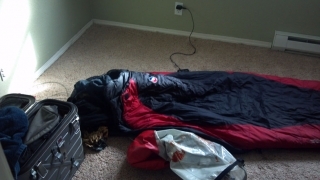 He came and collected me, and we dropped off my stuff at his place. Next we went to pick up the bike. We brought a couple of pallets and worked out the best way to use them to get the bike up. The technique that worked best was using them like stairs to get the bike closer to bed-level, and then we simply lifted the bike, one end at a time, inside it. Tal secured the bike with ratchet straps and we were good to go! Yay! Ticket avoided! 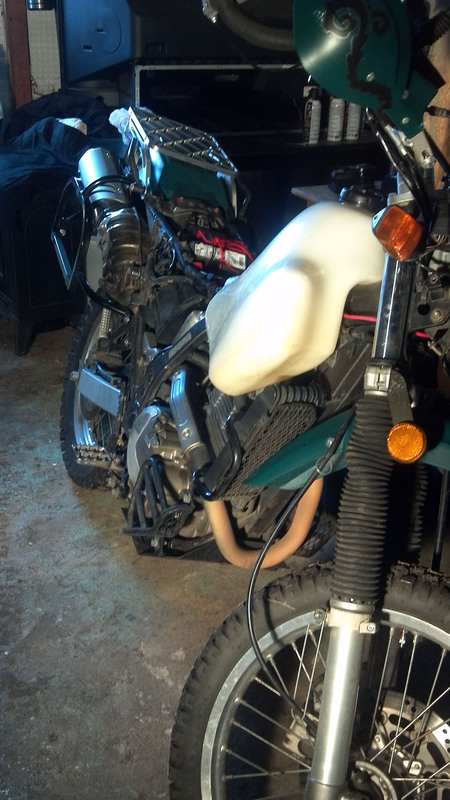 We managed to get the bike out of the bed, no worse for wear from its voyage, and stowed it in the garage. I would deal with it tomorrow. I spent a while catching up with Tal. It was good to see him again after over three years! I had a great nights sleep. It was definitely a luxury to sleep indoors, warm and dry, listening to the rain on the window. The next morning, I got down to business, attempting to figure out the bike’s starting problem. I followed the manual, eliminating possible causes one by one. I disconnected/bypassed the clutch safety switch. I tested lots of components with Tal’s multimeter, but everything checked out fine. Very frustrating. 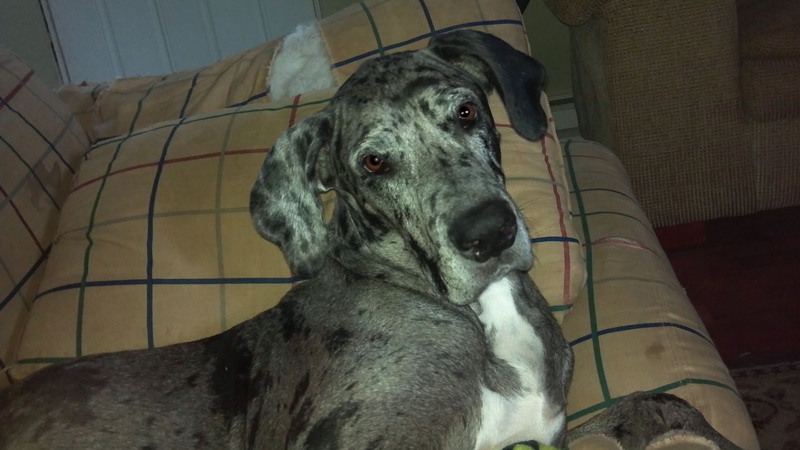 I took breaks to run around outside with Tal’s ridiculous 3 year old great dane, Molly. That dog is HUGE! I felt that with the proper saddle, a little kid could probably ride her. 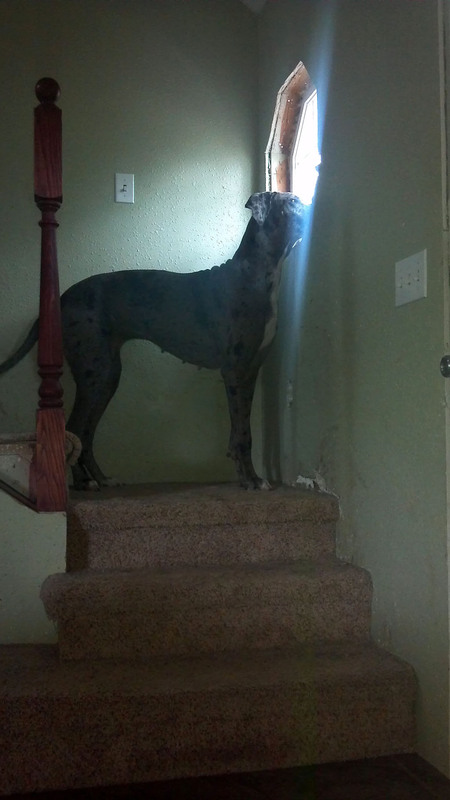 Gotta love a dog tall enough to look out a window. 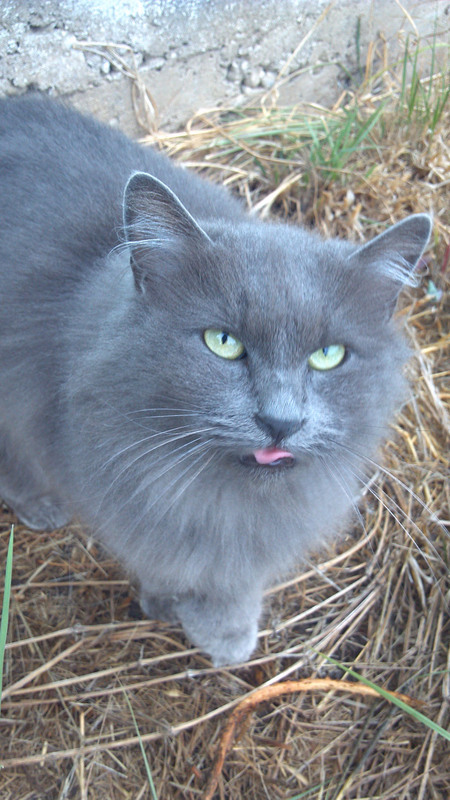 Tal also had a grey polydacyl cat, Boots, who kept me company. Lots of head-scratching and research later, I felt it was down to the ignition or a random faulty wire. The starter relay wasn’t getting power and the weird “crowing” noise I’d experienced before turned out to be a common cold-weather DR complaint and not necessarily indicative of something amiss. I’d checked the fuses and looked over the wiring harness earlier at the parking garage. The diode and neutral connector measured correctly, as did the battery. I felt pretty proud of myself for diagnosing things this far… this was the first day I’d actively used a multimeter! Frustrated after so many hours without results, I decided to do an “idiot check” before giving up and looking into bypassing the ignition. I opened up the box to check the switch itself. While trying to read the voltage, I accidentally bridged the solder points on the back of the switch, and with all the safeties now removed, it purred to life, thankfully in neutral. BWAHAHAHA! IT’S ALIIIIVE! Giddy, I ran inside to tell Tal the good news. 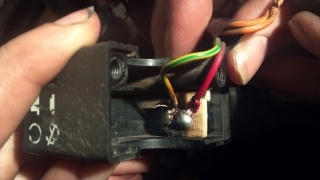 One of the solder points looked a bit shoddy and the copper contacts on the switch were tarnished. It appeared that water had been getting inside the hole where the kill switch used to be and was fouling things up. I felt pretty stupid… I should have checked this on the very first day, when I had it open to inspect the kill switch wires, but at least I managed to figure it out! By myself too! I was excited to be able to leave tomorrow! Even though I felt dumb for not figuring it out sooner, I would have felt much worse if I’d had a friend drag me all the way back to Portland for something so simple! I took Tal out for some cheap Mexican food and a drink in celebration. Then, later, I had a luxurious hot bath and relaxed. What a great end to the day!